A wildfire named the Dues Fire is burning about one mile northeast of Cleveland, Oklahoma in timber, short grass and brush in the area managed by the Osage Agency of the Bureau of Indian Affairs (BIA). Fire behavior consists of moderate fire with backing, creeping and smoldering. There has been 2,484 acres scorched and fire crews have reached a 95% containment status. There are 11 total personnel which include two engines. One structure was lost. The total cost-to-date of fire suppression and containment expenses equal to approximately $13,000.00. INCIDENT SUMMARY. The Chetco Bar Fire is located E/NE of Brookings, Oregon in the Rogue River – Siskiyou National Forest on the Kalmiopsis Wilderness. The fire started on July 12, 2017, from lightning. RESOURCES. Currently, there are 402 personnel with five crews, two helicopters and 10 engines. While there are fire crews still working, there is also a Burned Area Emergency Response team or known as a BAER team on-scene assessing post-fire impacts. They are made up of resource specialists and scientists. They are also evaluating watershed conditions to determine the potential risk to human life, safety and property. CURRENT FIRE STATUS. The fire has burned 191,121 acres and there is a 97% containment status. DAMAGE ASSESSMENT. The fire has said to have burned six homes and 24 other structures, while it has damaged one home and eight other structures. SOCIAL MEDIA. We are using the hashtags #ChetcoBarFire #ORwildfire #NWFireBlog Please join us on our Media Channels on Facebook and Twitter (@nwfireblog). We’d love to see you there! Due to fire season not being officially over, we wish you all safety wherever you may travel. Incident Summary | This wildfire is burning on the Wallowa – Whitman National Forest on the Anthony Lakes West of the North Powder (Baker County) in Oregon. This wildfire was reported on August 4, 2017, around 1400 hours PDT. Cause | The cause is unknown and is under investigation. Resources | There are 395 personnel assigned to this incident, alongside 9 crews, 15 engines and 4 helicopters. IC/Command is a NW IMT 9 team. Size Up | Firefighters have made good progress on spot fires and improving fire lines. The fire behavior remains to be active with short-crown runs, short-range spotting and single tree torching. 489 acres have been consumed and there is a 30%containment status. Fire Image | Courtesy of Inciweb. 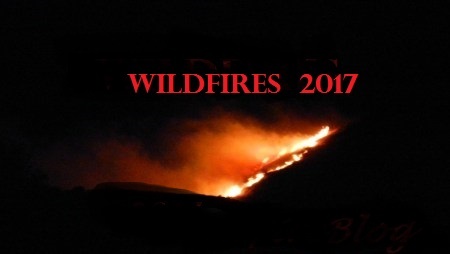 A wildfire was sparked by an unknown cause that occurred on Monday evening, July 31, 2017. 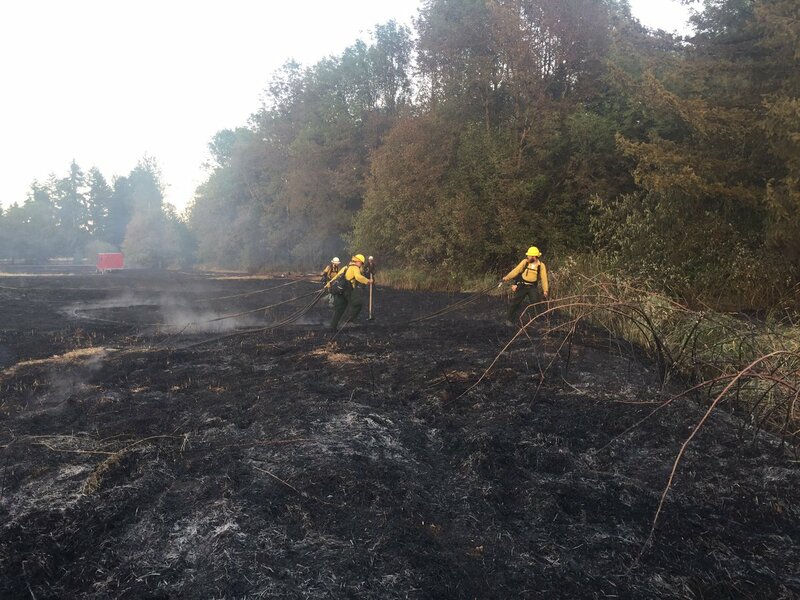 The fire was located on Highway 12 @ 180th Avenue in Thurston County, Washington. Update! | Firefighters have been able to contain the wildfire to 3.3 acres but they will be on the fire line throughout the night. That is Great News and Thank You Firefighters for your tireless efforts – as always! No fire suppression and containment costs-to-date were known. Here is what it looks like after firefighters tirelessly worked to contain and control the fire. Two wildfires broke out in Florida dubbed the #30thStFire and #FrangipaniFire that were said to have started on Thursday, April 20, 2017. The 30th Street Fire broke out around 1050 Hours PDT at 3280 30th Avenue SE and Everglades Boulevard that started out as a brush fire. Here is the timeline for this fire. 1050 | Brush fire. Heavy fire conditions. 10+ acres. Greater Naples Fire on-scene along with Immokalee Fire. 1150 | Brush fire. DOF helicopter arrives on-scene. E32 arrived with Engine Strike Team. Moved out of Staging to mop up hotspots as fire progresses. The fire is now moving Westward away from the Everglades Blvd. 1253 | Fire continues to burn. E32 now is in Structure Protection mode. Fire is still moving Westward. 1257 | Fire now at 300 acres with a 0% containment status. 1257 | Fire ignites and is at 100 acres burned. 0% containment status. Multiple structures threatened. 1318 | 30th Street Fire is now 420 acres with 0% containment status. Frangipani Fire is now 125 acres with 0% containment status. 1433 | Alert: Residents living nearby fires to monitor conditions, local and Social Media for possible changes. 1456 | 30th Street Fire is 500+ acres with a 0% containment status. Frangipani fire is 300+ acres with a 0% containment status. 1536 | 30th Street Fire is 1200 acres with a 10% containment status. The Frangipani Fire is 350 acres with a 10% containment status. 1543 | 30th Street Fire is at 600 acres moving Westward and may have mandatory evacuations per the County Emergency Management office. Red Cross is providing resources for Firefighters. 1544 | Alert: Smoke is a respiratory irritant that may cause a scratchy throat, cough, headaches or irritated eyes. Avoid prolonged exposure. 1634 | Both wildfires are still 10% containment status but fire activities are decreasing due to increased RH. 1722 | The 30th Street Fire is at 1300 acres. The Frangipani Fire is now at 350 acres. Both wildfires have had the forward ROS stopped. 2308 | No other reports from sources reporting on this incident. Those reporting and working on this wildfire were Caloosa Hatch FC, Collier County Emergency Management, Immokalee Fire PIO, Greater Naples Fire and Florida Health Collier. The cause of these two wildfires are unknown at the time of this posting. The May Branch Fire broke out on November 3rd around 5:00 PM EDT (2:00 PM PDT) just West of Nanatahala Lake in the National Forests of North Carolina. It is being managed by a USFS Type 4 ICMT. The fire is said to be have caused by human intervention but there were no exact details released as to what actually occurred. Currently, the fire has consumed 175 acres of hardwood litter #9 but fire crews have reached a 50% containment status. However, the fire behavior is still active, flanking, backing and creeping. Future plans by Fire Managers are to have crews go into mop-up operations, reinforce control lines, monitor and patrol. Weather concerns consist of low RH and drought in the area. There are 34 personnel assigned to this incident. No injuries, evacuations or damages have been reported. Date/Time Started: The Hicks Creek Fire started on 10/17/2016 around 4:45 AM PDT. Location: The fire is located approximately 3,5 miles South of Cedar City, Utah. Cause: The cause of the fire is currently unknown at this time, but was Media was reporting it may be from an escaped debris pile. Fire PIO says that a private landowner was checking on a smoldering debris pile and called it in and saying that it is human caused but unknown how. 3 homes have been evacuated. No structures have been damaged or injuries have been reported. Staffing: 70 personnel from the State of Utah-Division of Forestry, Fire & State Lands, Bureau of Land Management; US Forest Service; Cedar City Fire and Iron County. Command: A Type 3 teamtook over Management of the fire today.